Go, whose grandfather launched Ideal Optical, is confident and determined to achieve their goals. As head of branding, marketing, and merchandising, she is always finding new opportunities to explore, expand, and discover new solutions to make eye care accessible to everyone. Despite growing up in a family of eye care professionals, Go’s involvement in the eye care industry is not a childhood dream. Her initial passion was food which explains why she has a degree in Culinary Arts and Related Services. 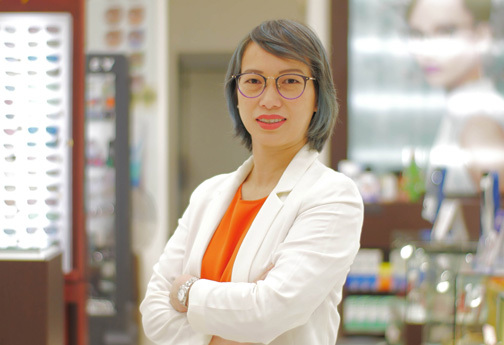 Her interest in eyewear and eye care was piqued only when she started working part-time in IVC. “More than the technicalities behind being an optometrist, I find the marketing and research side of the business very endearing. Aside from that, I am also very interested in eyewear fashion,” she shares. Go also reveals that being in the eye care industry gives her a meaningful purpose of taking care of other people’s needs and well-being. It has also become important to her to provide only the best vision solutions. To be able to do that, Go notes the importance of partnering with brands that share their vision. Hence, their partnership with Essilor, she says, gives them an opportunity to provide clients access to world-class eye care products. “Partnering with Essilor for more than 32 years is the best move we made to improve our service to our customers. We at IVC knows that Essilor shares the same vision with us—to offer top-notch eye health care to Filipinos,” she enthuses. Aside from this vision, Go shared her personal goal of leaving a legacy in the eye health care industry.